In view of the continuing wet weather we are having to review the viability of all our pitches for training and matches on a weekly basis. Many pitches last weekend were holding water on the surface and the additional rain this week has not helped matters. The problem has been compounded by the mild weather experienced before Christmas (which promoted grass growth), immediately followed by the current period of heavy rain, making grass cutting impossible. Both venues will remain closed for both training and matches this weekend. 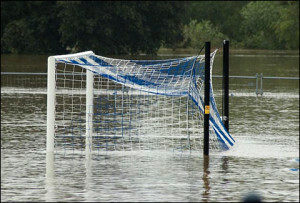 The U11s and U12s have already made alternative plans for Saturday training at an all-weather venue. Two home matches are scheduled for Sunday but will be subject to a pitch inspection early on Sunday morning. Alternative plans have already been for training; any home teams advised to try and reverse fixtures for Sunday. Municipal grounds will be subject to scrutiny by GBC before we know if they are playable. Other grounds will be subject to last-minute pitch inspections and teams informed accordingly. Looking ahead to next week, we have the possibility of a freeze to look forward to: more updates will be provided in due course. As ever, if it is possible to reverse match fixtures, Managers are encouraged to do so.